English Department Head Collette Weber was asked to present Student Voice, Digital Literacy, and Shakespeare: Bringing the Bard into the 21st Century at the 2018 National Council of Teachers of English (NCTE) convention held in Houston Texas. 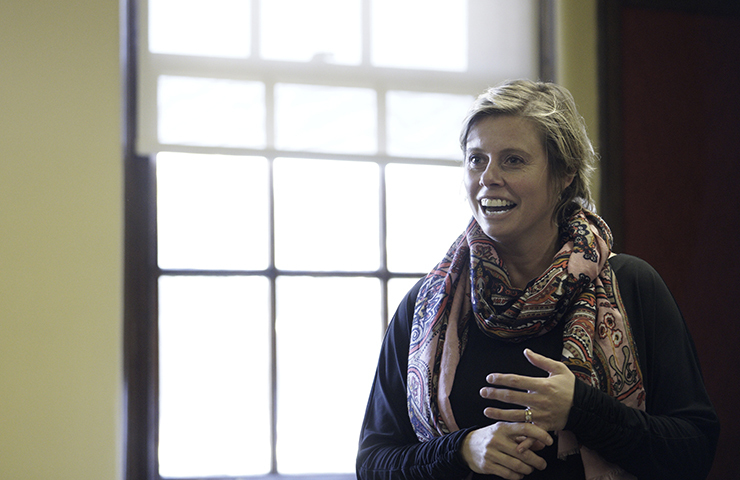 As part of the this year’s program “Raising Student Voice,” Colette shared how she and other faculty members at George School are exploring the timeliness and power of studying Shakespeare’s language in today’s classrooms and how their work is encouraging students develop their own powerful and persuasive voices, with a little help from the Bard. More than 7,000 authors, advocates, and educators from across the country attended the conference. “Shakespeare’s characters spoke about the very issues that plague our young people today. Studying these speeches inspires young voices to speak their truth and change culture,” said Colette. She cited Hamlet’s “To Be or Not to Be” soliloquy as an example of a speech that brings issues such as depression to light. In recent years, the English department has integrated speech writing into their study of Shakespeare’s works. “Inspired by Shakespeare’s facility with language, students write a speech on an issue of their choice. This is an involved process of planning, outlining, peer editing, and revision,” said Colette. The process of speech writing teaches students skills in rhetoric and persuasion, as well as recitation and performance. The project also aims to help students articulate their thoughts on issues in a format that is unconstrained by political affiliation. In the digital age, students have the world at their fingertips, and Colette’s hope is that students will learn to most effectively speak their truth and change culture.